Sara was born and raised in Manawa, Wisconsin. She earned an undergraduate degree in English from the University of Wisconsin-Madison and an MFA in Writing from Vermont College of Fine Arts. She is a versatile author with award-winning work in a wide variety of genres. With her fifteenth book, Sara tells the story of a 19th century Vermont poet, social activist and spiritualist, in Seven Years of Grace: the Inspired Mission of Achsa W. Sprague. The Vermont Historical Society named Sara a Weston Cate Fellow in 2003 to research the life and times of this remarkable woman (1827-1862). The work, which utilized the abundance of Sprague diaries, letters and materials in their archives, became an historical novel published in Spring 2016 by the Vermont Historical Society and the University of Wisconsin Press. At the age of 27, Achsa was a sickly and shy spinster from Plymouth Notch, Vermont when she was visited by guardian angels and given an urgent mission that would send this reclusive woman across American on a seven year Spiritualist crusade. Alone on stage, a single woman in the mid-1800s elicited jeers and catcalls. A skeptical Oswego, New York reviewer asked, “Why is it that all the world should run nightly mad to hear her in a ‘pretended’ trance?” A Milwaukee newspaper proclaimed her words “profound twaddle from beginning to end.” Yet Achsa’s crowds grew in size and enthusiasm until they numbered in the thousands. Since Spiritualist doctrine was progressive, Achsa’s mission took on an added dimension as she encouraged abolition of slavery and championed the cause of woman’s rights. Although prominent Spiritualists embraced Free Love (ridiculed in the press as “Free Lust”) Achsa claimed such debauchery was perverse. 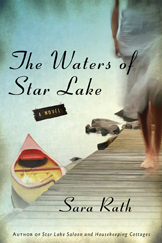 The Waters of Star Lake, a sequel to the popular "Star Lake Saloon," follows Natalie Waters as she revisits her family's rustic cabin in the northwoods and becomes involved in adventures led by Ginger and Lily who have dreams of discovering buried treasure. Publishers Weekly says "Rath returns to the setting of her first novel, Star Lake Saloon and Housekeeping Cottages (2005), for her pleasant third novel. Soon after recently widowed Natalie Waters Lindquist arrives at her family cabin in rural northern Wisconsin, an attack on her beloved dog, Molly, places her at the center of rising local tensions over hunting and conservation. After being roped by feisty Ginger Kovalcik into a hunt for a gangster’s lost treasure, Natalie’s summer is further complicated by the unexpected arrival of her troubled granddaughter, Minnow. Romantic possibilities emerge in hunky but secretive Bud Foster and handsome ecologist Will Davis. But a more compelling passion is Natalie’s fierce devotion to her family’s old home. Adventure takes Natalie and her eccentric companions from a roadkill picnic to a notorious gangster hideout, from a pristine morning lake to a rowdy bar called the Last Resort. The result is an affectionate portrait of this distinct region and its quirky inhabitants." Star Lake Saloon & Housekeeping Cottages, Sara's first novel, was published in August 2005 by Terrace Books of University of Wisconsin Press. This account of Hannah Swann, a woman forced to take a midlife detour to save a run-down fishing resort from an international mining corporation in the northwoods of Wisconsin was praised by Publisher's Weekly as "a diversion as pleasant as a quiet summer day at the lakeshore." Henry Hamilton Bennett of Kilbourn City (later Wisconsin Dells) was the subject of Sara's first book, a biography published in 1979 by Tamarack Press. Now The University of Wisconsin Press has now published a vastly expanded and revised version of Bennett's personal life and photographs, with exquisite reproduction of 178 Bennett images including many of his newly discovered works: H. H. Bennett, Photographer; His American Landscape. A new collection of poetry, The Night You Played 'The Snowy Morning Blues' will eventually join four previous collections, including Remembering the Wilderness, awarded The Banta Award in 1984 by the Wisconsin Library Association and the highly praised Dancing With a Cowboy published by The Wisconsin Academy of Sciences, Arts and Letters. The New York Times Book Review said The Complete Pig, published May, 2000 (paperback ed. 2004), "contains enough eccentric pig lore to leave the browser giddy with pleasure. And browsing is in order." The Los Angeles Times called it a "swine fest," and "eye-opening for those who think of the pig only as 'the other white meat.'" A companion book, The Complete Cow, 1998, was reviewed on NBC's TODAY and re-issued in paperback in May, 2003. Sara has two children from a previous marriage, Jay Rath and Laura Rath Beausire, and lives in the rolling countryside of the Wisconsin River Valley near Spring Green with husband Del Lamont, two cats: a rescued Manx named Emma, a rescued Muted Tortie named Olivia (who rules the house); and a silver charcoal lab -- Lizzy Lindsay Lamont. SEVEN YEARS OF GRACE: The Inspired Mission of Achsa W. Sprague. Historical Novel, published March 2016, drawn from archives in Vermont Historical Society. Sprague was a poet, social activist and spiritualist medium prior to the Civil War. Her life story is traced by her sister, Celia, who lived in Oakfield, Wisconsin. As read on Wisconsin Public Radio's "Chapter a Day," October 2005 and July 2006. Available as an (abridged) Audio-Book from UW-Press. See EVENTS page for upcoming readings and book signings.